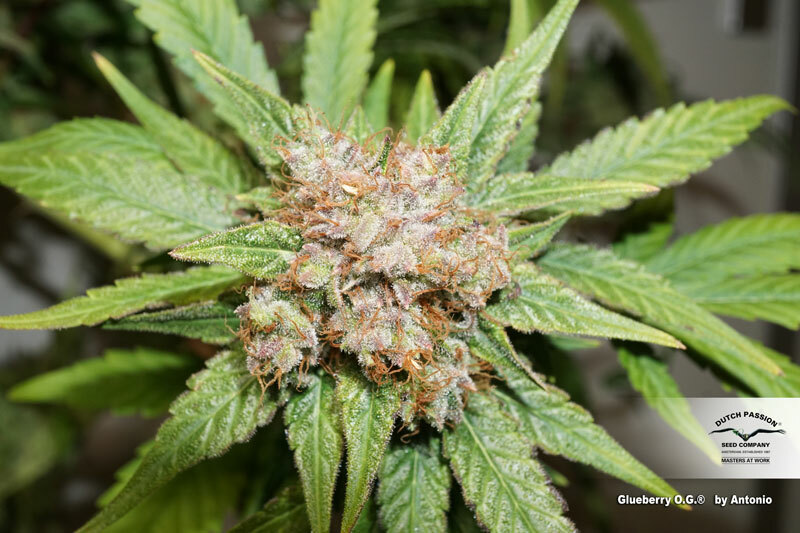 Home » Buy Seeds » USA Special » Glueberry O.G. Why should I get Glueberry OG seeds? Easy-to-grow plant indoors and outdoors. Glueberry OG is a hybrid indica/sativa strain with piney and earthy tones, a peppery taste and a fruity twist. The buds are very dense, expect rock hard THC rich nuggets. Glueberry OG is an indica/sativa hybrid. She is easy to grow, extremely potent and resinous with a deliciously powerful feel-good high. Glueberry OG is easy to grow. She is a tough strain suitable to grow outdoors in different climates. Of course, you can also grow her indoors where she delivers prize-winning results. Indoor growers should note that Glueberry OG can produce very large, dense buds. Good air circulation is important to reduce the chance of bud rot in warm/humid conditions. Glueberry OG is grown by hybridising our original Blueberry x Gorilla Glue (GG) x OG Kush. Gorilla Glue is a popular USA variety, this strain was the successful result of crossing Chem's Sister with Sour Dubb and Chocolate Diesel. These parents ensured the connoisseur taste and high of this amazing strain. Another great USA variety used in Glueberry OG is OG Kush, with a distinctive taste and mysterious heritage. Her taste and smell are definitely what many cannabis lovers want. 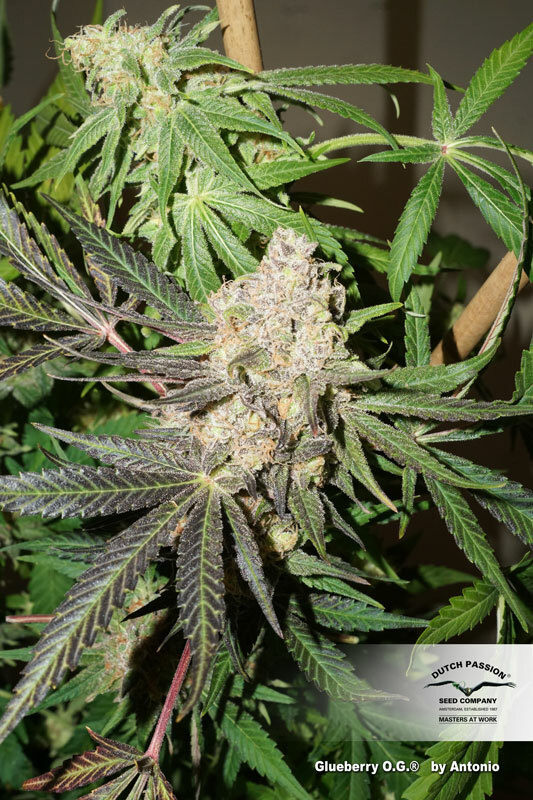 Blueberry is a famous and classic Dutch Passion strain which provides a rich berry aroma and fruity flavor. Glueberry O.G is an unique prize winning strain with a powerful and strong aroma. Glueberry OG is a crossing from a mix of Indica and Sativa dominant strains. The effects of Indica strains are very relaxing, providing a heavy body relaxation. While the Sativa effects are more uplifting and give a strong psychoactive cerebral high. In comparison to the Blueberry strain, Glueberry OG has a stronger effect and is a little less sweet. We recommend a veg period of 3-4weeks for these seeds. Glueberry is not the fastest in growth but it is a very strong plant. Glueberry OG grows under a wide range of conditions, so it is suitable for less experienced growers. 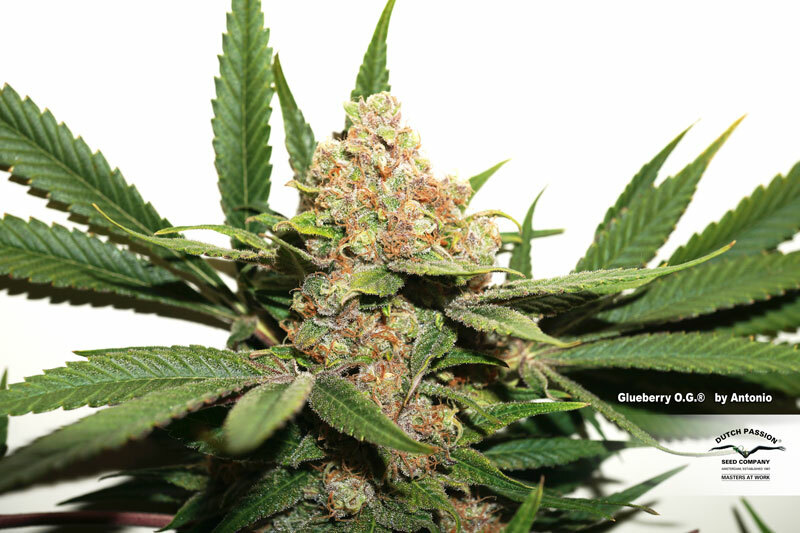 Glueberry OG reaches an average height of around 1-1.5m. It’s a connoisseur variety for home growing with XL yields of powerful THC rich buds. The flowering time is 8 weeks. In combination with the recommended veg phase, it will take around 12 weeks from seed to harvest. Glueberry OG produces XL harvests of top quality cannabis; between 400 and 500 grams per m2, the buds are really frosty and compact. Glueberry OG is perfect for home growers, including beginners and those that love the intense flavor and strong effects of the OG Kush and Gorilla Glue. She grows well in all grow mediums and in all grow methods. This is a tough variety which consistently produces potent buds. If you are looking for memorable prize-winning cannabis seeds which are easy to grow then look no further. Glueberry OG is one of the best varieties you can grow. Glueberry OG also performs well when grown in a SCROG environment, if this is your preferred growing method them you may wish to allow extra time during veg growth to really fill the net. Some growers would consider 5-6 weeks a suitable period, more if it’s a bigger SCROG. Experienced growers should note that Glueberry OG really responds well to intense lighting during bloom. Side lighting also helps this variety deliver XL yields. If you have a UVB light try using this for the last 2-3 weeks for a few hours each day, and watch the trichomes increase in number and density. LED growers will see great results in bloom. Glueberry OG is a popular variety with concentrate producers and lovers of cannabis oil, BHO, shatter, rosin, hash and other types of cannabis extracts. The high oil/resin content from these genetics make this a popular repeat buy for these looking to maximise their concentrate yields. One final tip from the breeder. If you like a really strong and heavy body stone from this variety leave her an extra week or two in bloom for extra amber trichomes. This produces a powerful couch lock effect which can be great for a night at home. great strain. smells like blueberry og kush, looks like gg, brill one. recommend to everyone !!! Second time growing a small garden of this. I'm hooked. Very easy plant to grow and very dense hard buds. Pretty good potency with awesome flavor and smell. Altogether gotta try this one. I'll put this plain and simple to those considering trying some GlueberryOG. Everyone I've turned on to some has had the same response, "WOW what was that we smoked" You won't be disappointed. What a lovely strain! Not sure how long I vegged for, just wait until the plants are big then flip, prob about 6 weeks approximately. Found two phenos, actually 3 but don’t think your average grower would notice the difference between 2 & 3, that & I cant be bothered to go into minute detail :p . It’s bound to happen when you’re crossing, poly hybrids to poly hybrids essentially. One is Indica dominant, stays short but gives you massive buds & the Pistils don’t go red/whatever colour, they stay white. Those ones are on upside down on chicken pellet buckets/tubs putting them at the same height as the others (about a a foot-18 inches shorter) however with the bottom of the others pruned for good air circulation , looks like the shorty ones will easily give up the same weight per plant as the others...... hope that makes sense. Left mine to go beyond 8 weeks & they have only got better for it. As of today, since flipping to 12/12 it’s exactly 10 weeks and one day, so coming down tonight. Had a test smoke at about 8 weeks, very very nice indeed with blue notes, earthy, slight diesel but I can’t honestly give a true taste & smell test until they’ve been dried & cured for at least two months. Good yield by looks of it, I’m useless at guessing, think there’s 250 & ends up at 500 grams per 600/660 watts per square metre. All depends what people are looking for, Glueberry OG is clearly top shelf, with maximum trichome coverage on each calyx, couldn’t get any more on if you tried. Only way to know, is to buy it & try it, same same with all new strains as with everything it’s subjective, someone may write a great review, others will go by said review but not like it. Just got to know your strains & what percentage Indica to Sativa the strain is. I have completed a grow of one plant of this strain with about 2 weeks into cure. I am extremely pleased with the results. During grow, the smell was of sweet blueberries until the last 2 weeks and the odor changed to what is now a strong pine with a flavor to match. Structure of plant was very indica dominate and stretch after flowering was easily manageable. The effects are nicely divided between a stoney head high with heavy body relaxation. I got my seeds during a Black Friday deal last year as I was looking for some g.g. genetics. I grew this plant 100% organic with super soil and led lighting. I manifolded for training and got 2 oz. from a 16" plant. Buds are medium dense and covered in trichs. This is one of the nicest strains I have grown in awhile. Highly recommend! I hear that. I will have to see the pudding. The strain is nascent online. Too new I suppose. All I'm saying is, as a paying customer and consumer, we should be able to have information like that available for decision making. Informed choices are better choices. appologies for posting twice but I didn't see Mericas post & can't keep my mouth shut ! @ Merica Are you serious Dude? I'm sure the team can speak for themselves but I can't bite my lip! Id like to see you tell all about the genetics of OG Kush, onsidering OG Kush was originally from bag weed ! Also I wonder what Diesel was used in the Chocolate Diesel cross, pheno #2(best but low yielding), #7 or # 10. Saying one of the oldest seed banks around has a "Mom & Pop" cross is a little insulting. Last but not least, have you any idea how many U.S. Strains come from Dutch Genetics? Nevil was shipping out seeds in soup cans to the U.S. 30 odd years ago & many of those strains expressed different phenos when grown in the states outdoors. There was no seed market in the states back only growers bringing back seeds from abroad apparently! I travelled for ten years in North Africa, India, Nepal & Se Asia & can count the U.S. travellers I met on one hand & they weren't exactly seed collectors! Why not cross it with Blueberry :p? What a weird question! Anyway most seed companies have their seeds bred by a few commercial breeders (not all) but quite a lot. Hi there D.P. We need more information as to the lineage of this strain. Specifics. There are many claims made about this or that, which is fine, but the "proof is in the pudding" as the saying goes. Mom and Pop cross that resulted in your alleged GG(4?5?11?12? forums are full of varying accounts but all cite the same group/grower) How did a clone only cut make it there? (I mean not the EXACT details obviously.) What OG Kush? That is awfully broad of a statement. Where is the result of that cross????? Why cross it with Blueberry????? Details man. DETAILS! certainly trying this masterpiece soon , ty Dutch Passion you make me proud to be Dutch !